November 28, 2015, Queens, NY Tyson Fury made good on his prediction by dethroning Wladimir Klitschko by decision. The judges scored the bout 116-11, 115-112, and 115-112. PureSportsNY scored the bout 116-111 (8-3 and 1 even in rounds). For Klitschko, it may very well be the end for the Ukraine-born, Ph.D. boxing champion who stood atop the division (with his brother Vitali) for over a decade. Klitschko is 39 years old, and based on his previous fight (a 12-round decision over Bryant Jennings on April 25th of this year and covered by PureSportsNY Senior Boxing Writer Greg Jacobs), he is very much on the decline. His physique is still magnificent. His face betrays that of a man who has been a professional fighter for nearly 20 years (his first fight was against Fabian Meza on Nov. 16, 1996). But the now former WBA, WBC, IBO, and IBF champion couldn’t pull the trigger against the mobile, younger, and more spirited Fury. 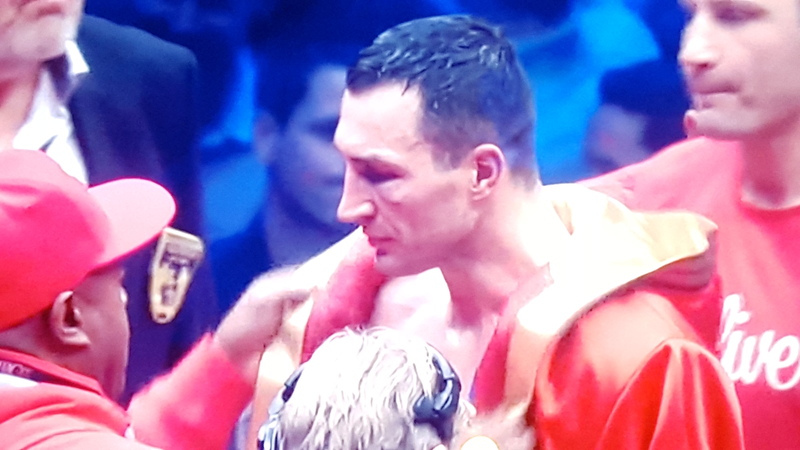 Klitschko’s record dropped to 64-4, 53 KOs. He hadn’t lost a fight since he was TKOed by Lamon Brewster on Apr. 10, 2004. 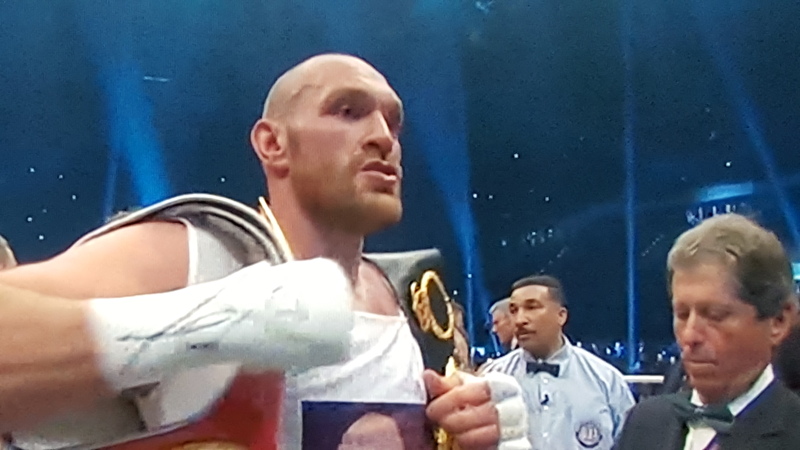 Fury won the fight because he was more active even though the fight was fought at a snail’s crawl. From the first round, Fury moved around the ring, circling a slow-legged Klitschko who failed to cut off the ring. The punch output and punch-connect was so low at times that in the 3rd round, Fury landed two punches and Klitschko landed one according to CompuBox. In the fifth round, Fury and Klitschko clashed heads resulting in Klitschko being cut high on the cheek. Fury continued to rabbit-punch Klitschko and was finally penalized by referee Tony Weekes in the 11th round. Between rounds 11 and 12, Jonathan Banks, Klitschko’s head trainer, implored Klitschko to let it all hang out in the final round since he was far behind in rounds. Klitschko gave it his best effort, but his best was not good enough as Fury stood his ground, not taking for granted that he had the fight sewn up. The final stats were as follows: Fury threw 371 punches and landed 86; Klitschko threw 231 punches and landed 52. Both fighters had a 23% connect percentage. Since the death of his trainer, the late great Emanuel Steward, the reins of Klitschko were handed to Jonathan Banks, a formidable fighter in his own right. However, Steward’s right-hand man was none other than the venerable James Ali Bashir who is one of the best trainers in the sport. Even though age was what probably defeated Klitschko, his fight plan was lacking. If Bashir were calling the shots, no doubt the fight would have been more competitive. The win improved Fury’s record to 25-0. Fury is a character and will infuse plenty of life in the heavyweight division. A unification match between Deontay Wilder and him would be a “braggart-fest” like we have never seen. Look for the two to meet for a mega-fight (and mega payday) late 2016 or in May or June of 2017.